Located in trendy Queen West just a block west of Bathurst (right next to the Raq n’ Waq pool hall), Destingo Kitchen + Bar is a comfortable, cozy and casual Italian restaurant. The word “Destingo” is a playful abbreviation for “destined to go“. In the winter season, it’s a very intimate space and in warmer weather it’s sure to be a trendy hot spot having a large terrace equipped with patio umbrellas and outdoor heaters as needed. Large doors on either side of the entrance swing wide open, bringing the outdoors right inside. Relatively new, it opened in the fall of 2013, taking over the furniture store, Pavilion. After visiting for a grand opening event and then also for a brunch, my third experience at Destingo was for dinner and it was quite a memorable one at that complete with attentive service and a great selection of wine by the glass (more about that later). Owner Monika Vacca is the former co-owner of Vaticano restaurant in Yorkville with former husband/executive chef Felice Vacca. I heard a few good things about the prosciutto di buffala (proscuitto and buffalo mozzarella) but I didn’t get a chance to try it myself due to being busy with other amazing antipasti such as the grilled calamari and sautéed wild shrimp. You can’t go wrong with a lot of the dishes given the care and attention to detail into each and every serving. At the reasonable price points, the quality and value you get might just exceed your expectations. 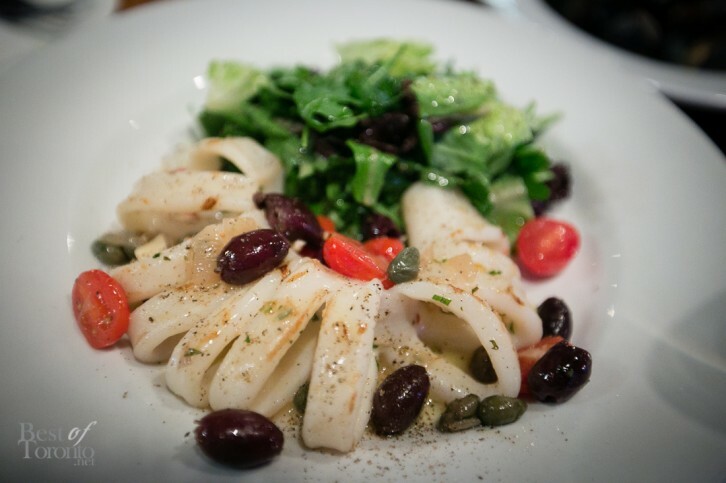 You can also choose to order the pasta dishes as gluten free, if you so desire. All desserts are made in-house including their signature tiramisu and boy, that’s how you end a meal: great dessert and aromatic drip coffee. While the food and service take centre stage, another interesting attraction is the enomatic wine system behind the bar. This is where bottles of wine are kept freshly sealed in a wine dispensing system so that you can try premium wines by the glass without having to pay for the whole bottle. So, in staying true to authentic Italian fare while not being afraid to modernize with an enomatic wine system, you can really taste and appreciate all the effort that goes into the entire experience even down to the house-made desserts conveniently near all the action in Queen West. I’m looking forward to revisiting in the summer for patio season! Check out our photos below. For breakfast options, they’re open 7 days a week starting at 7am including smoothies and other healthy options and free drip coffee or tea with every breakfast entree. Available for this season’s Winterlicious, check out their lunch and dinner prix fixe menu. By the way, if you’re interested in enomatic wine systems, I’m told by a representative at Bevtech that the largest commercial enomatic wine system in the GTA is at the Touro Brazilian steakhouse. And even bigger ones are in Montreal. The only home version dubbed “Enoliving” that I saw featured at the Delicious Food Show is not available in Canada yet but hopefully soon! Check out their video of the making of Destingo restaurant.